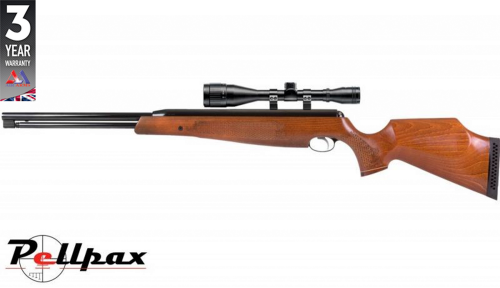 Having won the World Field Target Championship, the TX200 MK3 has a place amongst the best spring rifles available. The TX200 MK3 is one of the few rifles out there that can deliver match grade accuracy and performance without the need for external CO2 canisters or air bottles freeing you up and giving you confidence you always have the power when you need it. The TX200 has a power plant that has been specifically designed to provide exact shot to shot consistency you you always know where your shot is going. The under lever mechanism is designed to further increase accuracy as, unlike many spring rifles, the barrel is never broken and is always pointing exactly where you need it to. All this achieved with minimal friction, thanks to synthetic bearings, and stress to the mechanism to ensure a long working life with rifle shooting the same as the day you bought it. The TX200 also features a safe-Lok automatic safety system built in for added security throughout the loading process. The fully chequered stock of the TX200 is beautifully crafted and richly stained with flowing lines to effortless combine style and substance. Add this item to your basket & spend an extra £21.01 to apply for finance.